George Ridout, the miller and baker of Sherborne (1701-1779) had married twice. By his first wife Mary Hallett, he had many children, including John (1730-1797) and by his second wife, Mary Gibbs, George had two more sons, one of whom was Thomas (1754-1829). John went to America in 1753 and half brother Thomas followed him in 1774. John had settled in Annapolis, Maryland, married a governor’s daughter and was a close friend and personal secretary of Governor Horatio Sharpe, a relationship which would one day see Ridout owning Sharpe’s thousand acre estate and house at Whitehall. Thomas Ridout initially went to Annapolis but, after many adventures, he moved and settled in Canada in 1788 and held many prestigious positions in his time including Sergeant-at-Arms to the House of Assembly in 1794, Surveyor General of Upper Canada in 1810 and Member of Parliament in 1812. Married twice, Thomas had many children including George (1791-1871) and Thomas Gibbs (1792-1861). In 1812, at the age of nineteen, young Thomas Gibbs Ridout sailed across the sea to England to seek his fortune, if opportunity presented itself. He wrote many letters to his father and brother George during his travels including an interesting diary entry, dated Sunday 9th February 1812, concerning a brief visit to Sherborne, Dorset – his ancestral home. This passage and many others of interest are to be found in a volume entitled ‘Ten Years in Upper Canada: Peace and War 1805-1815’ having been collated and annotated by Matilda (Ridout) Edgar, daughter of Thomas Gibbs Ridout and wife of Sir James D Edgar. The volume was published in 1890. Lady Edgar also wrote a book called ‘A Colonial Governor in Maryland 1753-1773’, published in 1912. This is the story of Horatio Sharpe, his life and times as Governor of Maryland, a position which he took up in 1753 having travelled from his native Yorkshire taking with him a young John Ridout, as his secretary. Appearing as it does in such an authoritative and well written book, this paragraph has probably contributed to generations of Ridouts thinking that their ancestors were French Huguenots! As a genealogist, I see it as my duty to at least provide some alternative information so that interested parties might make their own judgement but I know that, once entrenched, these myths are hard to dispel and people will want to hold onto their beliefs which is, of course, their prerogative. The two points I offer in ‘evidence’ are these. Firstly, as already discussed in earlier posts, George Ridout the baker was son of Christopher Ridout of Sherborne (bp. 1669) NOT Christopher Ridout of Henstridge (bp. 1664). 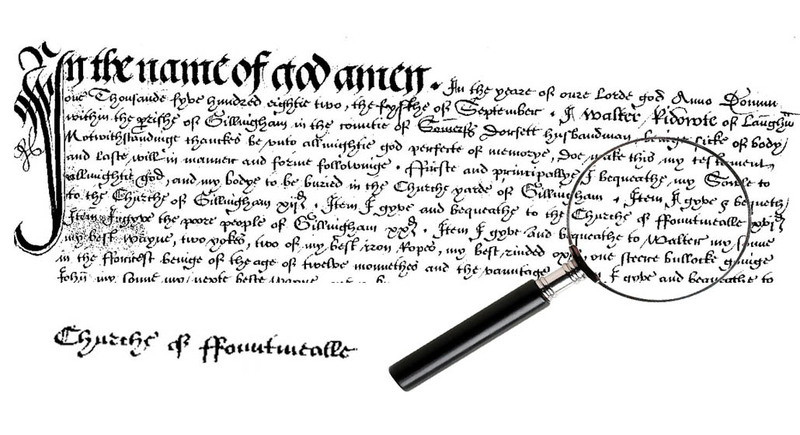 Secondly, an examination of the will of Walter Ridout of Langham, Gillingham, dated 5th September 1582, shows that he made a bequest not to the church in Fontainebleu, France but to the parish church of ffountmealle, which is an archaic spelling of Fontmell – as in Fontmell Magna, in Dorset! He left the church 16 pence. The Henstridge Ridout line is distantly related to the Sherborne Ridout line, according to yDNA test results anyway, and is also apparently of Celtic origin, not Norman descent i.e. French Huguenots! I can say with some conviction that these families are Dorset folk as far back as records can show – and so, therefore, are American and Canadian Ridouts who descend from ‘George the baker’. This entry was posted in General and tagged Annapolis, Canada, Christopher RIDOUT, Henstridge, Huguenots, John RIDOUT, Matilda EDGAR, Montral, Sherborne, Thomas RIDOUT, Whitehall. Bookmark the permalink. 4 Responses to Exploding the myth – Sherborne Rid(e)outs and the Huguenots! 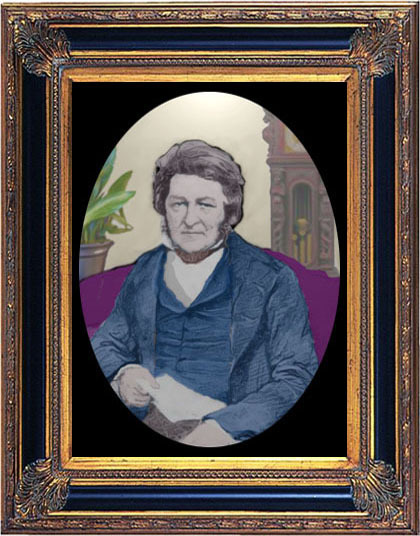 I am a descendent of Thomas Ridout living in Paris, Ontario, Canada. His (great?) grand daughter Dora was my grandmother. On a visit to Ohio and Kentucky last week, we drove along a stretch of the Ohio River which, after a bit of research when we got home, turned out to the the area where Thomas was captured by the Shawnee in the 1780s, which led to his eventual settling in Canada. I had heard this story since childhood and the river there was actually much as I had imagined it. This led me to your blog. Hi Ian… I’m so pleased you ‘dropped by’. I very rarely hear from Ridouts across the sea in Canada and the US, despite the fact that there are so very many of you, compared with the number of Ridouts in the UK. So, I’m glad you spotted the blog and I hope it is of some interest. I guess that your grandmother was Dora Isabel (b. 1885), daughter of George, who was son of Thomas Gibbs, who was son of Thomas? Of course, you and I are not directly related as you descend from Christopher Ridout of Sherborne (b. 1669) whereas I think my family descend from Christopher’s brother John. But I can’t really be sure as I am waiting for more Ridouts to take yDNA tests so that we can figure out where the various lines diverged. Still, our history becomes common at some point back in the 16th century. You have a wonderful lineage, full of very interesting characters. My line, of course, did not emigrate but stayed in Sherborne until my x3 great grandfather John moved to Bath in Somerset and founded his own little dynasty. Karen – thank you so much for all the work on this – quite frankly, my father was always highly dubious about claims of either Huguentot or Norman lineage, so I am happy to see you debunking the myth. You might be interested to know that both of Maud Edgar’s books are now out in facsimile editions – you can get them from either the publisher or from Amazon. I have just bought them (although I also own originals), and am quite happy with the quality of the facsimile. I don’t know how you find the time to do such first-class work, but we are all benefitting! Naomi…. I’m so glad that you have enjoyed what you have read on here; I enjoy doing the research and the writing! Soon, I am going to put all of this into a book and then the story of this Sherborne family, as I see it, will be ‘out there’ in a more widely accessible form. Thank you again for your interest.